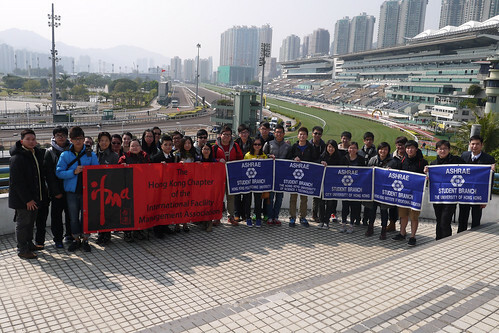 We held our second Student Event also the “First” Coordinate event with ASHRAE on December 29, 2013, at the Shatin Racecourse and Stable Energy Center. The Hong Kong Jockey Club is a world class racing organization that provides sporting entertainment under a widely admired not-for profit business model. The site area of Shatin Racecourse and the capacity is 700,000 m2 and 85,000 respectively which covers different facilities like Dinning Area, Betting Hall, Horse Stable, Data Centre, Telebet Centre…. Shatin Racecourse is a racecourse of superlatives – the home of the world’s richest day of turf racing, the world’s first retractable roof over a Parade Ring, and holder of a Guinness World Record for the world’s longest Diamond Vision Televison screen in 2003. Besides going to Shatin Racecourse, we also visited the Stable Energy Center. The district cooling system distributes chilled water or other medium from a central source to multiple buildings through a network of underground pipes for use in space and process cooling. It provide total 3,000 TR cooling capacity for 20 racing stable blocks. Moreover, a 1,000 TR cooling capacity will be added in the future in order to serve the Shatin Centre Complex building. A big thanks go to Mr. Jacky Ng, Project Manager (HKJC) as well as the committee member from ASHRAE for providing us with a comprehensive and informative presentation. Also thanks go to our President Dr Fanny Chun, Facilities Services Manager (HKJC) who arrange the visit and provide the interesting sharing with us. More than 30 student members registered showed that the visit was attractive and valuable. We would like to share with you some photos of the event and looking forward to see you in the future.